I was intrigued by this week's Food Matters Project recipe. 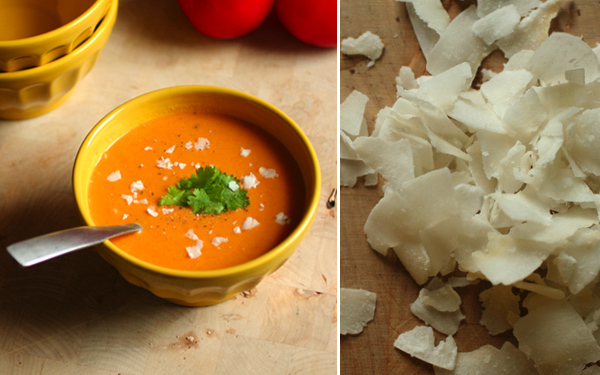 I love tomato soup and all things coconut, but I haven't used coconut milk in tomato soup before. I noticed the idea recently when I read Heidi's simple tomato soup post. After looking at the ingredient list for this week's Food Matters Project recipe, I was excited to see coconut milk listed, because I wanted to give it a shot. If coconut isn't your thing, don't worry. This soup doesn't taste like coconut. The coconut milk gives it body and richness, without overpowering the flavor. The curry really stands out here. 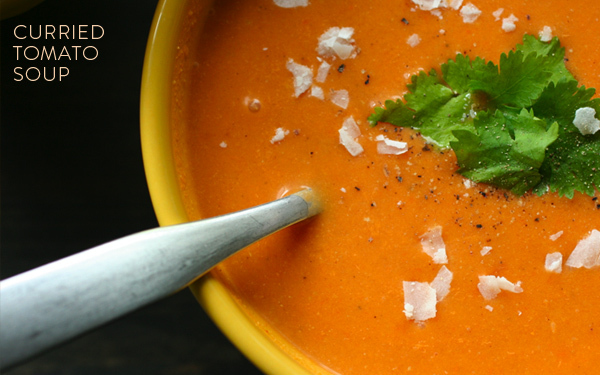 It also departs a lovely yellow-orange color to the classic red tomato soup. I replaced the potatoes with the humble turnip. 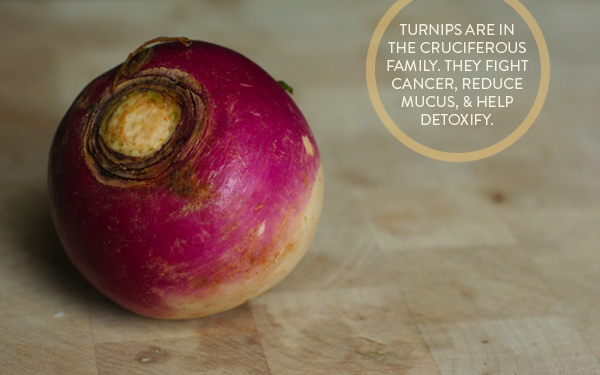 Turnips are a lovely vegetable that often go unnoticed. They're perfect here as they provide a similar starchiness to the potato as well as adding a healthy dose of vitamin B and C, potassium, phosphorus, calcium, and trace minerals to the soup (1). Bittman garnishes his soup with hard-boiled eggs, but I was lazy and decided to sprinkle with toasted coconut and cilantro instead. Make this into a heartier dish by serving over leftover rice, quinoa, or millet. Soup always seems to taste better with age. Preheat oven to 350. Add coconut flakes to a parchment lined baking sheet. Bake for 5 minutes or until lightly browned. Set aside. Heat dutch oven or large soup pot over medium heat. Add coconut oil. When hot, add onion, garlic, ginger, and jalapeño. Cook for a few minutes, then stir in the spices. When the spices are fragrant, add the turnip and carrot. Cook for a few minutes, stirring frequently. Add the tomatoes, tomato juice, coconut milk, and water. Bring to a boil. Reduce heat and simmer for 10-15 minutes. Add the cauliflower and cook for another 10 minutes, until all the vegetables are soft. Remove from heat, add the lemon juice. Blend with an immersion blender (or regular blender) until smooth. Be careful with the hot liquids. Garnish with freshly cracked pepper, cilantro, and toasted coconut. 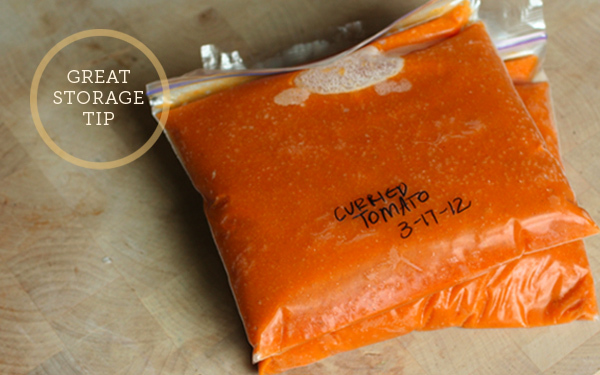 This recipe makes 9-10 cups of soup, so I decided to freeze some for later. I let the soup completely cool—by pouring into several containers and sitting in a large tub of ice water—then I put a little over a cup into each sandwich bag. Sandwich bags work better for individual servings, and gallon bags are better for families. I labelled the bag with the contents and date, then laid the bags flat in the freezer. Once frozen, they stack easily. When you're ready to eat them, put the bag into a bowl of hot water until the soup is almost liquid again. Pour into a soup pot, heat, and enjoy! See how Joanne and others made the recipe this week. Don't forget to follow the group on Facebook or to follow Adrienneats there as well! Source: (1) Wood, Rebecca. The New Whole Foods Encyclopedia. p. 367. Coconut milk and tomato is a combo I haven't tried before either, but I'm looking forward to it now. Lovely post, Adrienne! Lovely post! Soup looks delish and I love that you pureed it. I made Heidi's soup earlier last week and loved it! Served it over barley. When I saw this week's food matters recipe I decided to change it up a little : ) Love the toasted coconut topping and turnip additions! I love the toasted coconut garnish and the turnip addition. Pureeing this will definitely make for awesome tomato currys later on that we can basically add anything to. Great idea! Ooh Adrienne, your soup looks so great! I made mine really hearty and stew-like, but now I want a bowl of your soup. I haven't had soup in a while. It's high time I start. This looks fabulous! Whenever I eat coconut oil everyone asks me if it tastes like coconut. It really didn't.